That’s fine for humans, but for goats, one of the most unwelcomed weeds in the world happens to be an object of culinary desire. Goats love poison ivy, and that’s why the city brought in a herd to fight an infestation of the irritating plant at Wood School playground. Parks and Recreation Director Vincent Ouellette said this is part of a pilot program to determine just how effective the goats are in chewing through the many poison ivy plants. 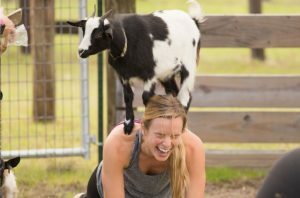 He said the idea was discussed last year after Mayor James Fiorentini’s wife, Martha, learned about a local company, Goats-to-Go, based at Great Rock Farm in Georgetown. Neighbors have been complaining that the fence surrounding the Wood School playground on Germain Avenue has become overrun with invasive plants, including poison ivy. They want the city to get rid of the overgrowth, which also will open up a better view of the park. City officials said they could not use pesticides to kill the poison ivy, so they came up with another solution. Ouellette said the goats became an instant attraction, with neighbors gathering in the park to watch them. Goats-To-Go owners Maureen and Alan Aulson have been bringing their animals to homes throughout the area where poison ivy is a nuisance. This is the first time they have brought them onto city property. Alan Aulson said the pilot program comes at no charge to the city. Ouellette said the results are promising enough to want to hire Goats-to-Go for a return visit. Alan Aulson transported 10 goats to Wood School playground on Wednesday, where he set up an electric fence to keep the animals from wandering away from the area where they were feeding on poison ivy and other invasive plants. He left the trailer on site overnight for shelter and set up an automatic watering system. When he returned Thursday morning, the herd had cleared a large maple tree of poison ivy that was growing up the trunk, as well as large patches growing on the ground along a section of fence on the east side of the park. Alan Aulson said the matriarch of the herd, a Boer goat named Lucy, is generous in that she tugged at the poison ivy growing up a tree so that smaller goats could enjoy the bounty, as well. For some strange reason, the chemicals in poison ivy that can send a person into an itching fit don’t bother goats. “It’s an irritant to us, but not to them. In fact, they relish it,” Alan Aulson said, adding that goats will consume 8 pounds of greens a day and will eat for about seven hours a day. Aulson said Goats-To-Go began bringing the animals to homes and farms last year to eradicate poison ivy that posed a nuisance and a health danger to homeowners. Poison ivy contains an oily allergen called Urushiol, which can cause an allergic skin rash upon contact with human skin. Aulson and his wife have 50 goats in all, but usually bring small herds such as the three males and seven females he delivered to Haverhill this week. Along with Lucy, there were fainting goats and Nigerian Dwarf goats. “Sometimes we bring a few sheep, as they like to eat grass,” Aulson said. 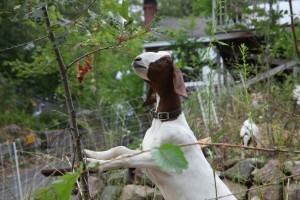 Ouellette said the goats made a good effort in clearing the poison ivy, leaving behind naked stems. “Now we can come back with mowers and knock down the growth,” Ouellette said.